With the city unsettled and rife with rumors, Eleanor Clifford's abrupt return to York upon the mysterious death of her husband in Strasbourg is met with suspicion in the city. Her daughter Kate is determined to keep her distance, but it will not be easy--Eleanor has settled next door with the intention of establishing a house of beguines, or poor sisters. 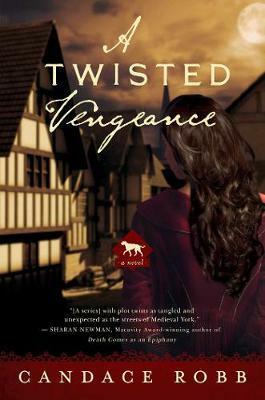 When one of the beguines is set upon in the night by an intruder, Kate knows that for the sake of her own reputation and the safety of her young wards she must investigate. From the first, Eleanor is clearly frightened yet maintains a stubborn silence. The brutal murder of one of Eleanor's servants leads Kate to suspect that her mother's troubles have followed her from Strasbourg. Is she secretly involved in the political upheaval? When one of her wards is frightened by a too-curious stranger, Kate is desperate to draw her mother out of her silence before tragedy strikes her own household. The heroine's second adventure is most likely to appeal to fans of serious historical intrigue.